We have a fabulous and fun Medieval Collection designed by Alison Acton with the characters "Charlotte & Charlie" coming and the WoJ Design Team and I will show you previews the whole week long :) There is also the chance to win a whole set of the new release (consisting of 10 stamps), but more of this below. Alison hat eine fabelhafte Mittelalterkollektion mit den beliebten Charakteren "Charlotte und Charlie" für uns designed. Die ganze Woche werden das WoJ Design Team und ich euch Vorschauen auf die neuen Stempel zeigen :) Es gibt ausserdem die Chance wieder ein komplettes Set dieser Neuerscheinungen zu gewinnen, aber mehr davon weiter unten. My first "medieval" card shows Jester Charlie on a male birthday card. I actually wanted to design a set of medieval sentiments with this one included, but time ran too fast. I hope to be able to get in done for the next release. Meine erste "mittelalterliche" Karte zeigt Hofnarr Charlie auf einer Geburtstagskarte für einen Mann. Der Text ist am Computer erstellt (obwohl ich eigentlich ein passendes Set designen wollte...aber die Zeit!!!) und ist ein Wortspiel. Jester = Hofnarr, just to klingt ausgesprochen so ähnlich, also würde der Satz eigentlich heißen "Just to say, Happy birthday" (Ich will dir einfach nur einen schönen Geburtstag wünschen). Just write a post about the new release (which is on Feburary 14th) on your blog to help me spread the word about it :) you can post the above picture along with it if you like. Write a comment under this post to let me know that you want to enter. Schreibt mir hier einen Kommentar, damit ich weiss dass ihr mitmacht. Das wars schon!! Der Gewinner wird am 16. Februar von random.org ermittelt. na das sind ja tolle Neuigkeiten!! Ich versuch mal mein Glück!! just to say that i have posted about the new release on my blog..
and to say good luck with the new release. love the card that you made with your jester charlie, it looks wonderful... great sentiment. Thanks for the change to win! Right now this is the only way I can get new items is by drawings! No income means no new fun toys! the jester stamp is just too cute - I definitely need more boy stamps! I would love to be entered to win the whole set. Have posted on my blog about it. Ooh, I can't wait! I've left you a link on my sidebar with the details. wow, ich bin schon total gespannt auf die Kollektion, der erste Stempel ist ja schonmal genial! Ich versuche auch mein Glück und habe schon auf meinem Blog gepostet! Lovely card Katharina and such a cute stamp, I can't wait to see the rest of them. I would love to be included in the draw, I have posted a link on my blog. This is so amazing you are truly spoiling us what a great start to a new year with another collection. I would love to take part in the draw off to post news on my blog. What a cute image! I can't wait to see the rest. I thought you said to post the link ON 14 Feb., but maybe it's the translation that got muddled. Anyway, I have posted a link to your sneak preview in my sidebar HERE. Thanks for a chance to win the new release set! Great preview! I like this stamp already! I've posted about the new release on my blog! Would love to win these stamps! Das hört sich ja gut an, hab gleich mal Deine Ankündigung auf meinem Blog gesetzt und bin schon auf die anderen Motive gespannt. Warte auch schon ganz ungeduldig auf das Kit... soviel Neues!!! Love this card, and the new stamps will be snapped up I'm sure. Good luck with all of that. I've posted a link on my blog, fingers crossed. Habe natürlich sofort einen Beitrag auf meinem Blog gepostet und die Neuigkeit verbreitet. I have posted about the new release, Charlie looks fab as a jester and I can't wait tosee the rest. Fab card and I love the sentiment. Good luck with th release. I'm looking forward to see the rest of the collection! I've left you a link on my sidebar with the details. I've written a little blog in Dutch, so Dutch fans will know there a new stamps coming. I like Hofnarr very much. Oh I am so excited. What a great card I can't wait to see the rest of the images. I have posted on my blog to let everyone know. Oh cant wait for the new releases...good luck to you, but, you dont need it! 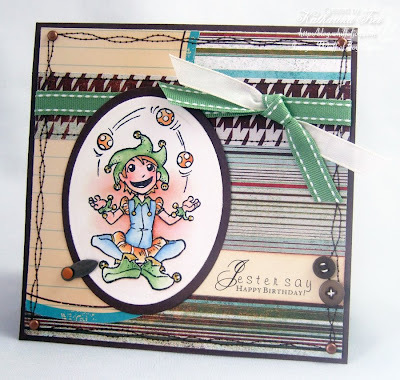 I LOVE the previes of jester Charlie, beautiful card and a beautiful stamp! I would love a chance to win the whole collection, I've posted on my blog about your new release. Good luck with the new release Katharina. Would love to see all the new stamps! Hei Katharina wow was für eine TOLLE Kollektion,obwohl ich nur dea einen Stempel gesehen habe bin ich schon voll begeistert und Deine Karte ist mega spitze geworden! Habe meinen Beitrag hier veröffentlicht! I am soooo excited!! I posted a link in the sidebar of my blog. Thanks for a chance to win. So very cute. I can't wait to see the rest. I just love charlie. I've linked you on my blog. 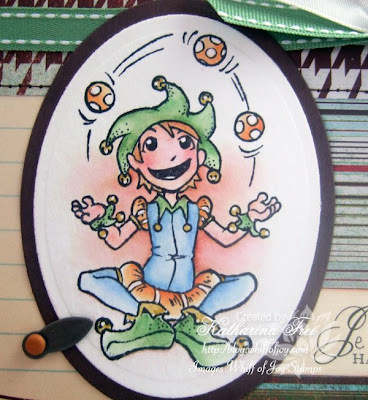 I love this Charlie jester stamp, so different for a male card and perfect! Love the way you have coloured him Katharina! I have linked this with a picture on my side bar and fingers crossed to win this lovely set...oooh can't wait! ich möchte gerne mit machen....vielleicht hab ich ja mal Glück...*g*. Wow..... die Stempel sind ja Klasse, ich beneide euch echt um eure tollen Ideen..
Oh, da versuch ich doch mal mein Glück. Die Stempel sehen ja wieder zuckersüß aus. Hab auch schon die Prizessin bei Flati gesehen. Gerne hinterlasse ich einen Post auf meinem Blog. A delight to come to your blog and see talented inspirations on all your creations! Gorgeous male card and all the best for the release. Post is on the right bar. Katharina- you have outdone yourself this time! this new set is looking like a must have! I am excited! Here is my blog post. wow i will surtainly spread the word! i love the new stamps, can't wait till the stamp set gets in. Bin schon auf die weiteren stempel gespannt. Hallo! Das sind ja super schöne Motive, die ich bis jetzt gesehen habe. Und gute Neuigkeiten sind ja immer noch die schönsten! Bin schon auf die anderen neuen Motive gespant. Ich bin auch gespannt auf die neue Kollektion, der erste Stempel sieht toll aus. love to see the new stamps! can't whait to see al the new ones! I would love to enter and get the chance to win the set! Really excited to se the new medieval collection :) Thank u! I'm spreading the word about the new collection on my blog. Ich hab auch die frohe Kunde von der Neuerscheinung auf meinem Blog "verankert" und hoffe, die Glücksfee steht mir diesmal zu Seite. What a fun theme for Charlie & Charlotte!! I would love a chance to win these stamps. Ich gratuliere dir herzlich zur Neuerscheinung. AUf Sonjas Blog habe ich die Prinzessin gesehen. Die Motive schauen sehr toll aus. Ich werde die Neuigkeiten auf meinem Blog erzählen. how cute! I have posted about the new release on my blog!!! Schon wieder so schöne neue Motive!!! Na, dann werd ich das mal gleich auf meinem Blog verbreiten! Ich freu mich schon drauf mehr zu sehen!!! Oh mann Katharina! Du machst einen fertig. Sind die schön, die neuen!!!!! Ich hab bei flati grad die Prinzessin gesehen und wusste sofort...Die muss ich haben! Ich verlink mal ganz schnell auf meinen Blog*g.
Wow, the ones I have seen so far are great! I have made a post in my blog! Charlie is so cute. I can't wait to see the rest.I've linked you on my blog. ich habe bei Sonja die Prinzessin gesehen und musste doch gleich mal wieder hier vorbeischauen. Die Neuigkeit habe ich schon auf meinem Blog verkündet, auch wenn ich mir so gar keine Gewinnchancen einräume. Auf jeden Fall bin ich gespannt auf die neuen Motive! How stinkin cute! I adore anything medieval and can’t wait to see more peeks during the week! I would so love winning this collection! I’ve copied the card and posted an entry on my blog as well as put it on my right side bar under my blog candy. Thanks so much for the generous offer! You can see my entry here here. How fun! I cannot wait to see the whole line. I would love to win the new set. I have added a link on my blog and am off to visit the dt's blogs! wow sind das klasse Stempel. Ich hab nun schon zwei gesehen (Jester und Prinzessin)und die gefallen mir total gut !!!!! Bin schon auf die anderen gespannt und werde gleich einen Beitrag auf meinem Blog schreiben. Nice stamps, I hope for som luck. I have linked at my blogg. Hi, what a lovely chance to win some more (I'm sure) fantastic stamps. I have put a post in my sidebar about the new release. The Jester looks fab. Uiiii toll!!! Ich freu mich schon auf die neuen Stempel!! die sehen ja süß aus, die neuen Motive!!! Ich versuche nämlich einfach mal mein Glück. Oh, mein Gott! Ich hab gerade die Prinzessin gesehen! Und genau die , und sonst keine, brauch ich bis Ende Februar. Den Stempel brauch ich für die Einladungskarten zur Geburtstagsfeier meiner Tochter! Und Jester würd so gut dazupassen! ... Ich bin total begeistert!!! You can view release from here. Terrific card, the image is great. Congratulations on the new stamps,and good luck! Wooo Whoooo!!! Now I am loving him. I can't wait to see the rest. I have you on my side bar dear. das ist wieder ein so toller Stempel und ne tolle Aktion. Na da versuche ich doch mein Glück nochmal. I´ve posted a link on my blog. Hi Katharina I just love the jester card an goo luck with your new release of the stamps. I off to post the new release and tell everyone. Wow! I surtently want to enter this! I've spread the words in my blog - you can find it at this post! Just to let you know that I have just put a post on my blog and a link to your blog. The stamps look great so I don't think I will need to wish you luck but I will anyway, Good Luck!! Just to say I have posted about your new release on my blog..
and to say good luck with the new release!!! Love the card that you made with jester charlie, it looks fantastic!!! so fun and a great quirky sentiment. Awe these are adorable stamps would love to win, thanks for the chance. I have posted Here. on my blog. I love the new Charlie!! I have posted about the new release on my blog! Here is the link! Love the Jester Charlie... Can't wait to see the rest. I have listed you in my sidebar along with a pictures of jester charlie. Thanks for the chance to win. Charlie never looked so cute! I would like to enter but I'll be honest...I do not have a blog. Guess I better get hip & start blogging! Love your card Katharina!! Can't wait to see the new release!! Thanks so much for the chance to win some of your fabulous stamps!! Love the card! The WOJ Stamps are absolutely adorable. I have entered a post and a link back to here on my blogger for the contest. Look forward to seeing who wins the great new set. das sind ja klasse News. Und da ich mir die Chance auf den tollen Gewinn nicht entgehen lassen wollte, habe ich die Info auf meinem Blog gepostet. Can't wait for the 14th! Wow, I love the Jester Charlie, he is very cute....I would love to add Jester Charlie to my collection. I already have hubby Charlie, lol.... Off to look for more sneak peaks. Cute stamp. Would love to be included in your drawing. Always spreading the word about your stamps! PLEASE include me in the drawing to win the new releases! I have posted on my blog here! das hört sich ja klasse an und ich veruche mein Glück auch mal. I just love your stamps. I posted a note on my blog about your new stamp kit and I hope to be lucky this time. Please look at my blog. Really nice stamps! I've posted a link on my blog. The stamp looks great!! Love the colors in your card.. I have posted about the release on my blog..
Ta carte est fantatisque, comme d'habitude, je devrai dire. Et ces nouveaux tampons m'ont l'air bien sympa. die bisher gezeigten Stempel sind ja wieder sooo süß. Bin schon gespannt was noch für süße Motive kommen werden. Eine Mittelalterkollektion find ich phantastisch und der Hofnarr hat schonmal mein Herz erobert. Wieder einmal tolle Motive, die soo vielseitig einsetzbar sind. Schade, ich habe keinen Blog, sonst hätte ich gern die Chance zum Gewinnen genutzt. I would like very much to take part in your blog candy. I've enter a post on my blog about it. das sind tolle Neuigkeiten. Ich habe mich direkt in den ersten Stempel verliebt! Deine Karte ist auch ganz bezaubernd. Ich bin schon sehr auf die anderen Stempel gespannt. Just left a comment on my blog - thanks for the chance to win, good luck for the new releases. das sind ja spitzen Nachrichten, wo ich doch gerade dabei bin mich in die WoJ Motive zu verlieben. Die Karte ist wundervoll geworden, ich freue mich mehr von Dir zu sehen. Hi Katharina, just made a post on my blog about the new release! Wow I've seen a few peeks and am sure these are going to be a huge success. Good luck with it. Thanks also for this amazing chance to win the whole collection. Hi Katharina, I have put a link on my blog to yours. I love the Jester stamp and am sure the rest will be just as good. Please include me into the draw. Can you say NEED,WANT, Have to have.... OOOOhhh ya!!! So So SO cute....... I have linked you on my blog and cannot wait to see who the lucky winner is!!!!! lovely images, I'm linking you too and hope to win! I've made a post on my blog http://benedihs.blogspot.com/2009/02/whiff-of-joy-release-14-februar.html. I also posted a link on my leftr sidebar. das ist klasse und ich freu mich auf die Chance es zu gewinnen. Deine Karte ist allerliebst geworden. Ich hab auch auf meinem Blog gepostet. OMG! I just orderd a few stamps and now these gorgeous ones! I will post it on my blog! Good luck with the new release!! Ich habe ja schon lange auf weitere Stempel der Serie Charlotte und Charlie gewartet. Ich freue mich also riesig darauf und abgesehen davon, dass ich bei sowas noch nie gewonnen habe - versuche ich es trotzdem nochmal. I've made a post on my blog about the new release - love the one's I've seen so far! Thank you! and i super impressed and excited and can't wait for these stamps!!! Awesome stamps you have. Would very much like to have some too :) I have told about the release in my blog. Ich versuche auch mei gluck! Die sind suss! Die möchte ich gerne bei meiner collection haben. Als limburgerin ist die fassenacht nog im blutt, und dieser narre is suss! Oooh Love the card, he looks so cute. Please enter me I have posted a link on my blog. Can't wait to see the rest of the set! Good luck with the new release! I would love to win this set. I just have made a post about it on my blog. Hi I have put a posting on my blog http://coldwaters2.blogspot.com to tell of the launch of the new stamps I have added the picture and would like to be given the chance to win a set of these gorgeous stamps for myself. Katharina, what a lovely little character he is and he's been made into such a lovely card. I shall look forward to seeing the rest of the stamps. Gorgeous card, I love the stamp image! Hello, Since I have boys in my family, I would love the chance to win this set and thank you. I am sorry I do not have a blog -- maybe one day. Just too busy working. Ich liebe die Jester Charlie Stempel und habe auf meinen Blog gepostet. OH wie schön neue Wiff of Joy Stempelchen. Mittelalter das hört sich spannend an. Thanks for the chance to win these gorgeous stamps by Alison.Good luck with the release! I'm so excited about your new release!! I worked at my local Renaissance Faire for 13 years and I adore Medieval stamps! I can't wait to see the rest and I hope I win!!! I'm drooling on the little jester. My husband used to have this crazy green and purple jester outfit. Just imagine the fun cards I can make for him. Beautiful release!!! Love your stamps! sind die neuen Stempel herrlich!!! Da bin ich ja mal total auf die ganze Kollektion gespannt. Thanks for giving the opportunity. HI from Italy, I often visit Whiff of Joy site and I like your stamps! I have some of them and I will proud to get the new collection!!! Habe gerade Blog-Hopping betrieben um möglichst viele der neuen Motive zu sehen - denn sie sind, im wahrsten Sinne des Wortes, märchenhaft schön. Das Angebot mit dem Bild habe ich übrigens gerne angenommen. Aloha and greeting from Hawaii! Wow this is a great and cute stamp. I have postabout the new release on my blog. Das sind wunderschöne Stempel und vor allem ist es mal etwas anderes. Ich freu mich schon riesig auf die Kollektion und versuche einfach mal mein Glück mit dabei. Danke schön für diese tolle Chance und macht weiter so. Hallo Katharina, dass sind ja wieder ganz reizende Motive. Ich versuche mein Glück und habe von deinem Candy auf meinem Blog berichtet. Love your cards, thanx for the inspiration. I will link to your page. Wow, I love these stamps. I've left you a link on my sidebar with the details. Wow, tolles Bild! Kann es kaum erwarten den Rest zu sehen. Hab auf meinem blog hier darueber berichtet! Love this. It is too cute. I am linking to here from my blog and would be ever so grateful if the random generator picked me! Hihi, he's cute! I'd love to win this set and I spread the news here on my blog. die neuen Stempel sind ja wieder einmalig schön!!! I LOVE this one! Must have...even if I don't win! Can't wait for the release! I have added you to my blog along with a Willow in the Rain card I made. I am so excited to get the chance to win these great stamps. I love Charlie as a Jester, just too cute. oh Katharina it's fabulous !!! The stamps are so cute. and would love to win the new set. WOW what a fun new line!!!!! Love princess Charlotte and what a fun castle!! off to post!!! Wow! I would love to win these cute stamps. I don't have any WOJ ones yet but would dearly love some as I think they are great. Möcht mein Glück auch mal versuchen und hab auch auf meinem Blog davon erzählt! I love this stamp and can't wait to see the entire collection!! I am going to post about this wonderful blog candy on my blog right now!!! Your Charly card is wonderful. I like Whiff of Joy stamps very much. How wonderful! I just love knights and dragons and castles! I've posted about the contest on my blog - thanks for a chance to win such a great prize! I'm seeing alot of the new releases in blogland...they're fabulous! I would love to own some WOJ stamps, thank you for this opportunity! Hach Katharina, deine Karte ist total süß geworden. Cute! Of course I want to enter your draw! Love the WoJ stamps! And I haven't got too many "boy stamps"! I will help you spread the word and post about your new release in my blog, rightaway! Have a nice day!